Probe below xiphisternum angled up towards patient’s head with marker to left flank. 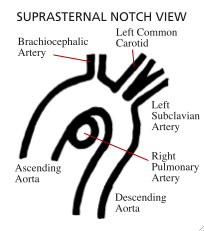 Assess dimensions and functions of ventricles and valves. Look for a pericardial effusion. Septum (reduce nyquist limit to detect low velocity flow). Rotate probe anticlockwise looking at RA until IVC comes into view (often need to angle deeper too). 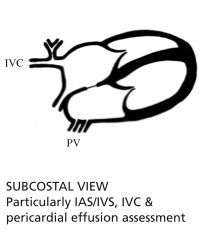 2D and M-mode of IVC. Can get short axis view of LV too if poor PSAX images. Use colour as well as 2D to inspect. Measure Vmax of descending aorta.